Circus Mirandus meets Cartwheeling in Thunderstorms in this beautifully written fantasy novel about a girl who must face her fears in order to right a terrible wrong, confront what it means to be different, and discover her own power. Smoke has come to the Cirque Magnifique. And Sasha Brown is sure it is her fault. Sasha has always loved the Cirque, a place filled with sequined costumes, dazzling spotlights, and magnificent tents. But when she starts fifth grade with the Islanders—the ordinary folk from the other side of the Island—for the first time, she’s not so sure she wants to be a Cirque kid. She starts to question her home and her Cirque family. Is the magic real? Are the stories even true? As the bullying by the Island kids gets worse, swirling blue-gray Smoke appears. One night in the big tent, Sasha’s dad performs, twisting his body through the air as the lights dance. Sasha is supposed to be helping, but instead she sits beneath the bleachers, seething. She has wished for the Smoke to come and make it all disappear: the Cirque, her family, the Island with its mean Island kids. And the Smoke does come. As Sasha watches her dad, he flips and raises his arms out for the bar that is supposed to meet him, his bright grin confident and sure. But there is only air…and Smoke. Both of Sasha’s parents disappear that night, and it’s all Sasha’s fault. What can she do but try and find them? K.D. Halbrook is the author of the critically acclaimed young adult novels Every Last Promise, which Kirkus Reviews called “lyrically written and ebbing with suspense” in a starred review, and Nobody But Us, which was called “raw, immediate, and utterly unflinching” by Booklist. She’s the cofounder of the popular website YAHighway.com and lives with her family in Seattle. She can be found online at KristinHalbrook.com and on Twitter @KristinHalbrook. Sasha and her family live at the Cirque Magnifique; they are different from the Islanders with whom they share their town. Formerly home-schooled, fifth-grader Sasha and her little brother, Toddy, are now starting public school. Sasha is responsible for making sure that Toddy isn't teased or mistreated—he's different from most other kids—but Sasha's being bullied herself. As if that's not enough, the Cirque's longtime enemy, the mysterious Smoke, is making an appearance, slowly billowing around it. Sasha, who is growing more and more frustrated with her family as she approaches adolescence, is not entirely unhappy about a dark, sullen force slowly overtaking the Cirque—that is, until it engulfs the Cirque during a performance and turns her parents into birds. Sasha and her brother struggle to subsist on their own before setting off on an adventure to rescue their parents. They solve riddles and defeat monsters along the way. Halbrook's writing is artful. Fans of Cirque Magnifique are as amazed by the sequined and feathered performers as they are enchanted by the magic of the Light at the center of this unconventional family of gifted outcasts. 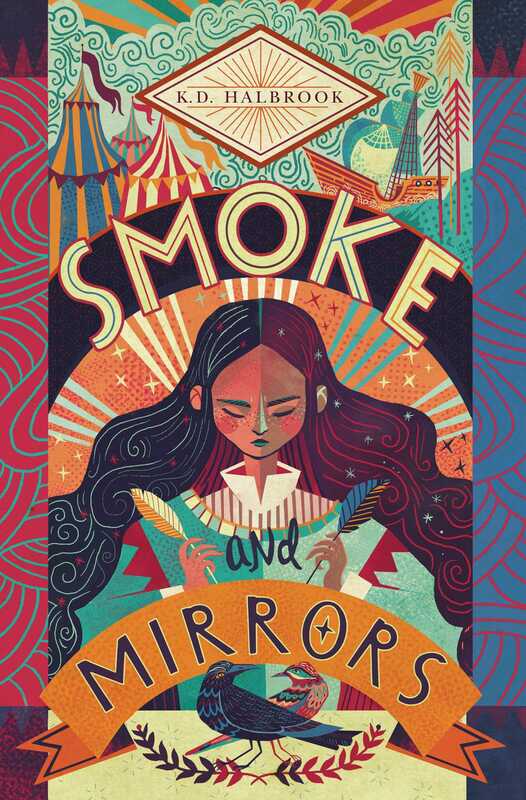 Fifth-grader Sasha, the daughter of the Cirque’s trapeze artists, was taught to believe that the Light is the only thing keeping the sinister Smoke at bay. When she and her little brother begin attending school with the rest of the Islanders, who constantly bully and harass Cirque kids, Sasha’s connection to the Light wavers, and she begins to resent her family and everything that makes her special. After Sasha blows up at her parents, the Smoke emerges stronger, causes a high-flying accident, and takes her parents away. She and her brother must voyage to the Edge of the World, the source of the Smoke, to save their parents. Halbrook writes a heartbreaking account of a young girl’s spirit buckling under her longing to be accepted and her negotiating of a complicated legacy. The novel’s wistful prose and a relatable search for the Light will be rewarding for readers who can see in the Smoke any number of metaphors for the things that haunt us. A fairy-tale atmosphere wafts through Halbrook’s story of magic, love, belonging, and circus....The story centers around Sasha's inner turmoil, but its strongest aspect is her relationship with Toddy. Their love for each other keeps them afloat as societal and otherworldly dangers loom. Personal revelations and faith in magic lead to a happy resolution to this enchanting tale.